How fun is this?? I've had this image in my head for weeks and it's great when the finished card actually resembles what I envisioned. The hot air balloons are colored with Copic markers in some bright summery colors. I inked up the "sky" part of the sentiment with a turquoise marker, and then inked up the rest of the sentiment with a black ink dewdrop. The smaller dewdrop inkpad is perfect for small scale inking like this. These window cards from Creative Cuts and More are so versatile and fun to use. I've done so many different kind of window cards over the past year - fall, winter, spring, summer, butterflies (my Sunday post), and more. 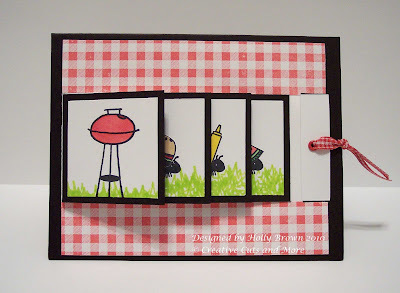 I've got more ideas so stay tuned for more creative inspiration using these Four Pane Window Cards. :-) Hope you have a great week! It's been a while since I played with my glitter, so I pulled them out and had fun getting all glitter-fied! Hee hee hee! 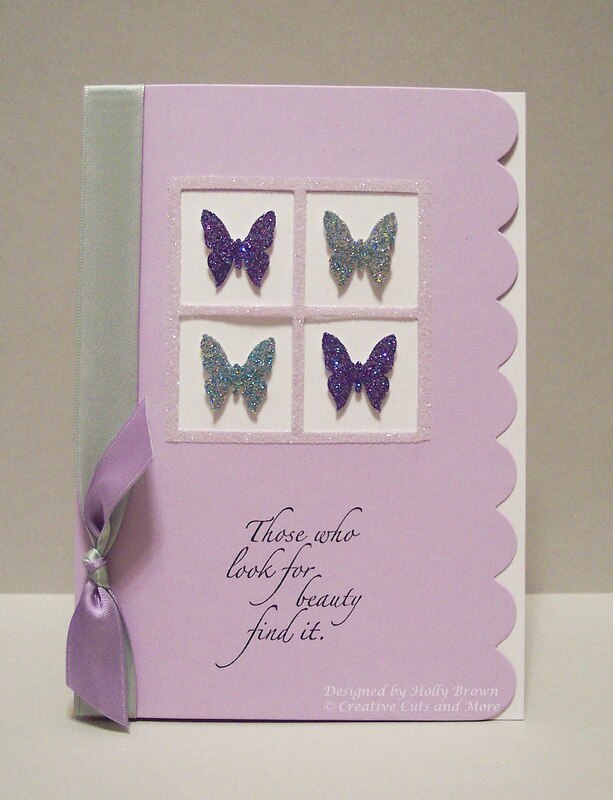 For this card, I punched out the butterflies from some adhesive paper (it's sticky on one side and plain paper on the back side), pulled off the protective paper and glittered them up. I smooshed the glitter into the adhesive with my fingers just to make sure it was good and stuck and then brushed off the excess. I used some 1/4" red liner tape from Creative Cuts and More and adhered it all around the window and on the windowpanes. I wanted a softer look around the window so it wouldn't distract from the colorful butterflies, so I went with a white Martha Stewart glitter. The stamped sentiment just seemed appropriate with the beautiful butterflies, so I used a dark purple ink and stamped it directly on the card. Instead of adding a bunch of embellishments that would overshadow the delicate butterflies, I just tied a ribbon on the side. Remember the bookmarks that I was having so much fun with? Well, today I've created some fun summery tags using a polished stone technique. These will be great to attach to a gift for someone's birthday or even tucked inside a book to be used as a bookmark. Do you like the polished stone tags that I've created for you? These are really easy to make. 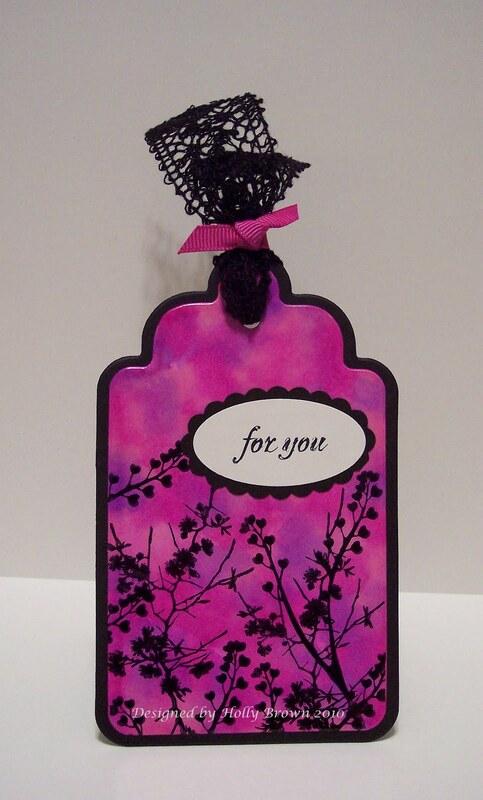 All you need are the tags (glossy white cardstock) from Creative Cuts and More, some alcohol inks, some Alcohol Blending Solution (from Ranger), and the felt applicator for the alcohol inks. 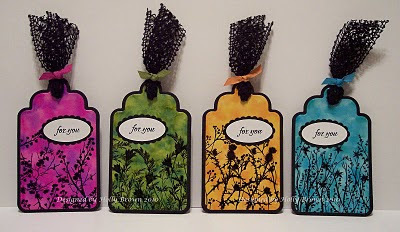 Pick two or three colors of alcohol inks, and then follow the directions for the Alcohol Ink tutorial HERE on Splitcoaststampers. I didn't have any ribbon that matched my tags, so I pulled out some white grosgrain ribbon and colored it myself. All I had to do was cut a small length of white ribbon and squeeze small drops of alcohol ink on the ribbon. The ink spreads out and saturates the ribbon so you really don't need much to cover a small piece. Everyone That LOVES to Read needs a BOOK-MARK! I know circles can be hard to work with, but I knew that I wanted to work with some photos I took of Maggie when she was 2, playing in the sprinklers & the circles reminded me of water! First, I asked Terry to cut the album out a great "water-blue" (Bazzill Smoothies, Tropical Blue), but when I started working, I noticed that I was also working with some light pink paper from my stash & the album was starting to take on a "baby" feel. So I promptly pulled out my Glimmer Mist (a blend of Moonlight & Glacier) to alter the blue background! I love the effect it gave to all the pages! For the cover, I cropped my fav pic of Maggie into a circle in Photo Shop Elements & layered it with another circle that I dry-embossed with a Cuttle Bug Swiss Dot folder. The flowers are from my stash, but I know you could get some small flowers from Terry & use the Doodlebug Glitter to jazz them up! The title is from TPC Studios. On the back cover, I covered the circle with Sassafrass Lass polka-dots, inked it with "Weathered Wood" Distress Ink, matted Maggie's photo in Bazzill's Bubblegum Criss Cross Textured cardstock & added a few more flowers. Both the front cover & back cover were attached to the rest of the album with Basic Grey Gemstone Brads so that they could "swing-away" from the rest of the album with it's opened up! See how the covers are now upside down when the album is fully opened? That's because they have to swing out to reveal the pages underneath! On pg1, I used the small flower embossed with a Tim Holtz Collaged Embossing folder & inked with "Weathered Wood" again, underneath the hose diecut. Maggie is matted in the Basic Blue by Bazzill Smoothies. Here, I simply used the great filmstrip dies to showcase Maggie trying to drink from the sprinkler! Aren't those dies great!! Pg 4 simply has a couple stars (one cut in the Bazzill Bubblegum & the yellow is from my own stash covering a chipboard star) & another embossed small flower. That's it - my little Summer Celebration book of Maggie! Guess you hadn't thought of that?!! First, I Misted them all with Tattered Angels Glimmer Mist in Vintage Pink & Antique Rose. Then I attached some gemstones in grey to the ends & layered each photo holder to create a flower! Just another way to use up your supply stash in a uniquely creative way! Hello Divas! This is Chris!!! I hope you are enjoying your Father's Day! Today, we thought we would share some project pictures from a few of our customers! 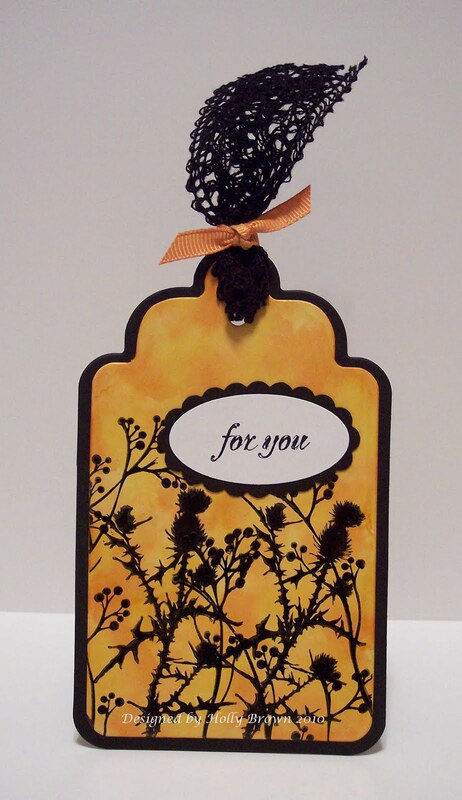 We love receiving pictures of WHAT you create with the die cuts from Creative Cuts and More! So if you want to share the photographs of what you create, please send them to customerservice@creativecutsandmore.com and we will put them in our Customer Gallery on the website HERE. The first two photos are from Debbie Hughes. She made a clear acetate cake – large – one layer – it is really too cute. Debbie used the Cake Slice Box Set - Large This is absolutely Scrumptious! The second customer to share a photo with us is Jennifer Staples! She used the product Cake Slice Box Set – Two Tier. 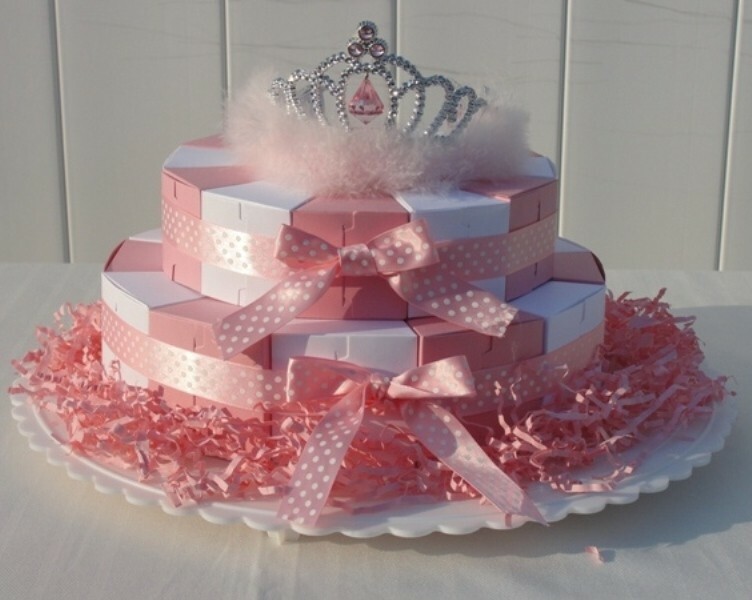 Beautifully created and perfect for any little princess! Thank you so much for sharing your photos with us! We would love for YOU to share your photos with us too! Thank you for stopping by! Have a great day! Square Bag for any occassion! This is my MOST favorite bag of all time. It's the Square Bag #01-Large. 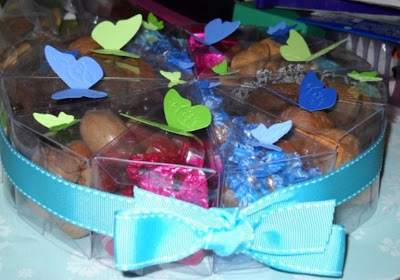 It makes for the best favor bags for a baby shower, like this one HERE or THIS ONE for over the winter holidays. The possibilities are endless! Here is a fun color combo for ya. Try it out. I loved making the matching card too. FYI: The butterfly and leaf are Martha Steward punches. I hope you all got crafty for the Father's in your life! Leave us a link to your latest project. We'd love to see what you're working on these days! Hi, Lisa here today, and my project is for the men in your life! I used the Creel Box Die Cut in Chocolatey Chip, for a cute Gift Card Holder. This box is a snap to assemble, decorate your panels, then add some Killer Red Tacky Tape and adhere your end together, easy peasy! Instead of decorating the box with pattern paper, I stamped my image on Matte Card stock, then used the Pulled Glimmers Technique from the current TJNL to add color to the background. I went back and added additional colors with an H20 Brush and Distress Inks. Then cut my panel to fit the front of the Die Cut. Hi all, Becky from The Scrap-a-Teeny Girls here! Sum, sum, sum, sum, sum, summertime!! Summertime! The best part about summer-time to me is all the BBQ-ing going on! I love the smell of the grill! I have even joked with my husband when he steps in from the grill that he's wearing my favorite cologne! I JUST LOVE that charcoaly-smokey aroma stuck to his skin & clothes!!! Or simply stepping outside on a hot summer day to smell a grill working somewhere in the neighborhood! Ahhhhhh! Sum, sum, sum, sum, sum, summertime!! Summertime! Ok, I'll stop all that! 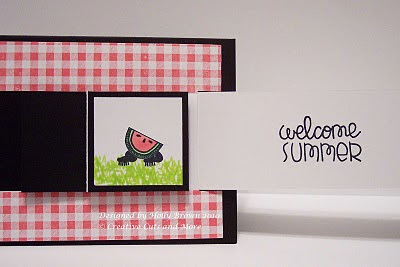 So, when I saw this die-cut, I knew I had to make a little "Q" card with it for my first post after the Patriotic Blog Hop! I may just have to do a little "Ode to the Q" on my personal blog soon too! It's pretty simple & I hope ya like it! 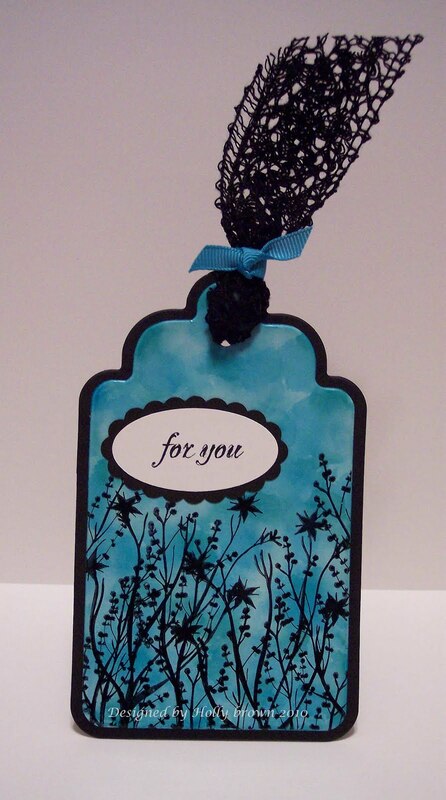 I used a CC&M A7 card in Bazzill Blue Canvas Textured cardstock. I applied embossing ink & red embossing powder to parts of the Barbecue Grill #01-Small, but then I turned the grill over & "flicked" some of the crystals off the front. This allowed for only some of the areas on the grill to be shiny from embossing! When the diecut cooled off from embossing, I rubbed some "Tea dye" Distress Ink over the embossed areas to give it a more dirty-grilly-gritty look. Once the grill was attached to the card, I ran a few light lines of "Star Dust" Stickles up to the corner of the card. Then, I punched some 1" stars (Fiskars) out of BoBunny's "Block Party Chill" patterned paper & scattered them over the Stickles with Glue Dots. Finally, I added the "BBQ" label & arrow from the BoBunny "All About the Family" collection. A great way to use a leftover! Kim here to show you this great little "table card/favor" I made just for fun! I will probably give it to my in-laws during a family vacation next week! 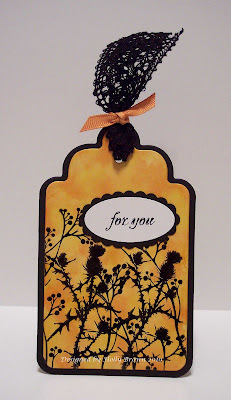 I made this little card from a left-over 8x8 album page! Simply folded 1/3 so that it looked similar to an envelope. I used Bazzill Smooth Cardstock in Real Red with sticker embellishments from Reminisce, Jolee & Sweetwater. Here's the interior of the card with a couple of pix of my son last year! I used a scallop punch for the other shapes & the stickers are from Simple Scrapbooks (freebie!) & Making Memories. Welcome to the Creative Cuts & More June Blog Hop! Kim, from The Scrap-a-Teeny Girls here! 2 years ago, my son, Jacob, participated in a re-enactment of the Revolutionary War with his classmates. Being a snap-happy-scrapper, I was ready with my camera!!! I began with an 8x8 album with some tabbed, acrylic & chipboard pages; some covered in patterned paper by Karen Foster & Sugar Tree, but the rest I left raw! Unfortunately, the Soldier die is not from CC&M, but from Little Extras. all from Creative Cuts & More! On pp 3-4, I got really creative with Hinges! I trimmed the decorative pieces off & used them for the tab & to make a little banner on page 3. then I used the leftovers to make a flag pole on page 4. I also used that sweet little banner at the top from CC&M! On pp 5-6, I used a small star cut from a sheet of acrylic & then I used some of Tim Holtz's alcohol ink on it! Also on this page is a small antique-style frame around my silly boys face! I just love the little filmstrips Terry has! The are great to use with the proof sheets you get when you pick up your photos! I finished up the last couple of pages with a few more fun dies from CC&M: another great filmstrip, another nameplate & buckle & that adorable schoolhouse! Various ribbons from my stash; digital images from Vintage Holidays Shop on Etsy; vintage book pages from the story of "The Dare Boys" by Stephen Angus Cox; Tim Holtz Filmstrip stamp; Teresa Collins; Crystal Sticker Elements (stars); Reminisce & Cosmo Cricket Stickers: 7 Gypsies decorative book edging. If you'd like to see close-ups of all the die-cuts, you WILL! Just follow the blog hop & when you get to "The Scrap-a-Teeny Girls" blog, you'll see some close-ups at the end of my sister's post there! But now it's time to HOP on OVER to Holly's Blog to see what amazing things she's crafted for us! What comes to mind when you think about a summer picnic? I always think of watermelon and cheap plastic red gingham tablecloths and a BBQ grill. It was fun to pull out a stamp set that had these picnic images and put them together for a special card. 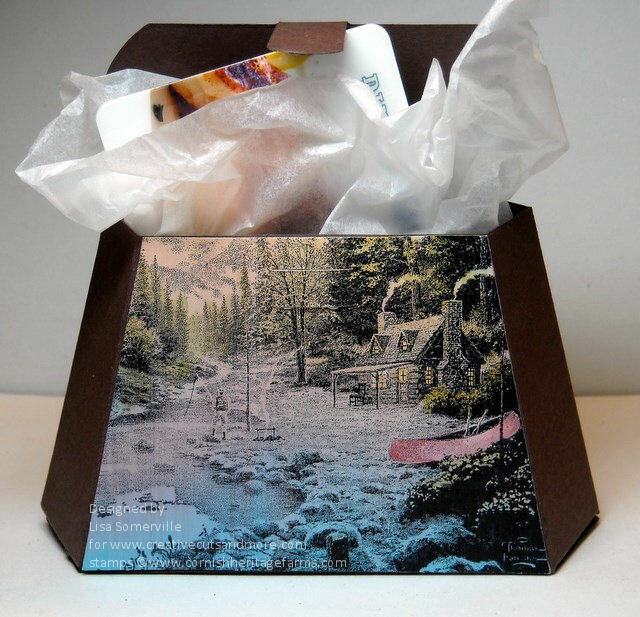 I used this exclusive Waterfall Card Set from Creative Cuts and More and let me tell you - it was SO easy to put this together. To put this waterfall card together, I followed the tutorial on their website HERE. That tutorial really helped me understand what goes where, and all I had to do was stamp and color my images for the four panels. It's Noelle posting today! This is a previously scheduled post! As you read this in the comfort of your home my girls and I will be road tripping to Arkansas. Where the heat is SUPER HOT and the bugs are ENORMOUS! LOL But 3 of my favorite men are there waiting for us! My Dad and both my brothers! Did you know if you put them in a A7 envelope you don't have to pay extra postage? Lately I seem to have a tiny little addiction to SQUARES! 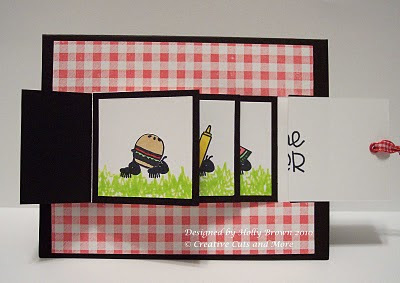 LOL I love the look of squares on square card and it is so QUICK to throw together a pretty cute card! This card is a Thank You card plus an I Love You card! I had some horrendous virus and the Sprite I finally was able keep down was the best thing I have ever tasted! I vowed right then and there if I lived through it I was going to send them an I love You and Thank You card! So here it is. I hope whoever opens it gets a little smile for the day. I used so many different stamp sets on this, it's crazy LOL Square #1, #3 #5 & #7 are KI Memories. #2 is Stampendous. #4 is American Crafts. #6 is Inkadinkado. #8 & #9 are EK Success. I used The Bling Kit for all the centers of the O's, except for the 6th square, that is dotted with Stickles. I think everyone should make and send cards as often as they can. Happy Shopping!! Kayla here, to share another layout! On this layout I used the Large Scallop Circle, small scallop circle frame, Doodlebug Sugar Coating Glitter, and the Doodlebug Lilac Jewels. Here is a close up of the small scallop circle frame which was cut from tacky tape and I used Doodlebug Sugar Coating Glitter on. It was the perfect base for my flower! These two cuties are my cousins girls. My son has been asking for them daily, wondering when they are going to come and visit. We only get to see them once a year, which just is not enough! Back to the layout, I had so much fun making that flower. I think the glittery scallop circle frame makes a fabulous base! I really want to make more of these flowers now! 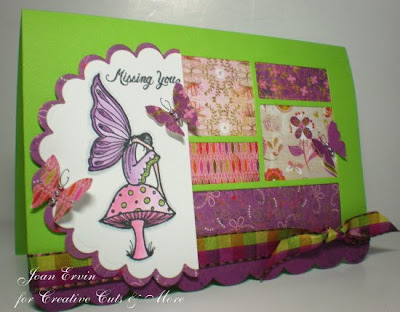 Other products used on my layout: Butterfly (not sure of the brand, I got it from the Dollar Tree), Bazzill cardstock (from CC&M), Basic Grey Paper, American Crafts Thickers, DMC Floss, Prima Flowers, Unknown Flowers, Colorbox Chalk Ink. SPOTLIGHT ON OUR GUEST DESIGNER!!! 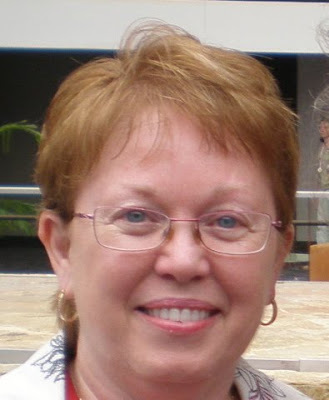 This month, we are THRILLED to introduce to you the VERY talented Guest Designer, JOAN ERVIN! 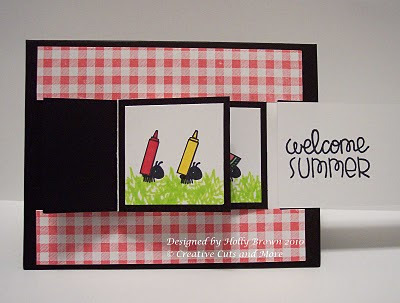 Hi everyone....first I want to tell you how excited I am to be the June Guest Designer for Creative Cuts & More!!! I am thrilled to be creating with such a wonderful Design Team and the quality products from Creative Cuts & More!!! I am a retired RN who loves to stamp, garden, quilt, play with grandbabies, and shop for antiques. I am married to George and together we have five children, four of whom are married, and twelve grandchildren. My parents live only two blocks away and are in pretty good health which is a real blessing!. I began my stamping journey several years ago when my DD Holly became a Stampin Up! Demo. She has given me lots of support and encouragement along the way...especially when it comes to buying stamps!!! I don’t know that I have a particular style...I love it all!! Shabby Chic, CAS, cutsie, elegant...I am a more is better kind of stamper and love to pile it on!!! I also love to color with Copics and my Tombow markers and I just started doing a little scrapbooking. 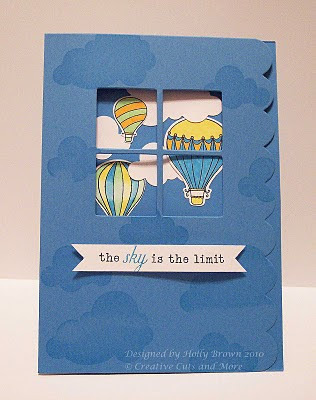 I am looking forward to stamping with Creative Cuts & More products and can’t wait to get started!!! Joan's card uses the Color Block Window A7 Scallop Card in Limeade. Joan had this beautiful May Arts ribbon for quite a while and was finally able to use it because the colors matched perfectly!! 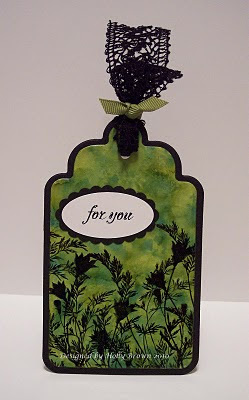 The card is 5x7 with a scallop at the bottom which she covered up with the Basic Grey Green at Heart paper. 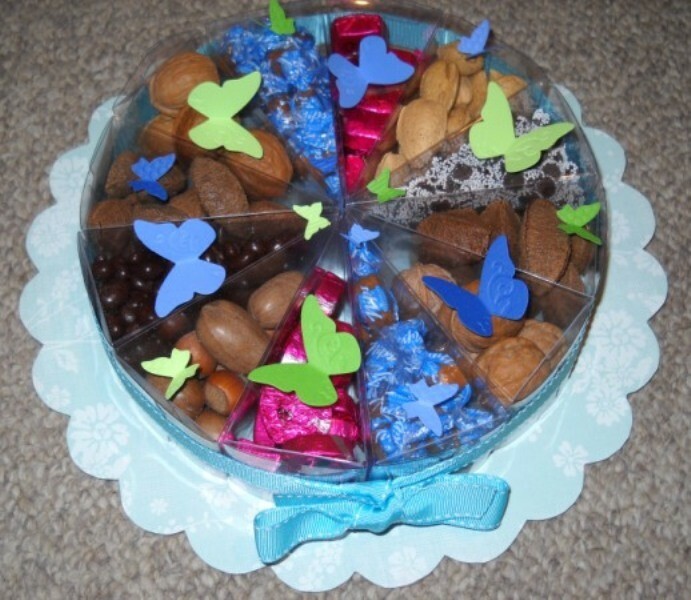 She also covered the blocked openings with the dp and punched the butterflies with it, too. The fairy image is from Sparkle & Sprinkle called Garden Fairies...it was colored with copics, cut out with round scalloped Nestabilities and attached with dimensionals. Silver pearls were added to the butterflies and she drew on the antennas. Be sure to come back for MORE Eye Candy from Joan! Please stop by her blog and give her a warm welcome as well!